My machine always sounds better when I'm using Aurifil. It could be my imagination, but ... it purrs when sewing with Aurifil. It doesn't sound bad with other threads, just not quite as good! (I have a Pfaff Quilt Expression 4.0.) Thanks for sharing the post! Very interesting article thanks for sharing. I know Aurifil is my go to thread hands down. I've recently started using WonderFil Specialty threads and it has produced very good results. 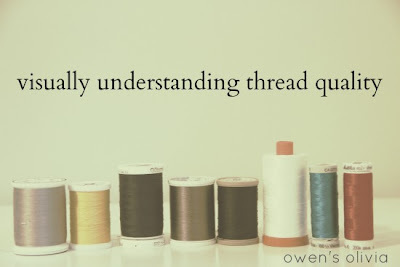 I like both Aurifil and Superior thread. That was really interesting. I learned a lot and feel glad I only use the cheap/old stuff for basting hexies. Thanks for the link, Diana!